South City Kitchen has opened its Buckhead location in One Capital City Plaza. The project, involving 6,000 square feet of space, has been in the works for more than a year. The new South City Kitchen serves lunch Monday through Friday, dinner nightly and brunch on Saturday and Sunday. Moving over from The Sun Dial Restaurant, Bar & View, Jason Starnes leads the kitchen team as executive chef. South City Kitchen's original location opened in Midtown in 1998, and another outpost is in Vinings. South City Kitchen, One Capital City Plaza, 3350 Peachtree Rd. NE, Atlanta, GA 30326, 404-815-6677. Ricky Walia, who owns Cafe Bombay and Masti Fun Indian Street Eats, has partnered with Sunny Minhas to open another Indian restaurant, this time in suburban Roswell. Besides popular classics such as chicken tikka masala, the kitchen offers innovative fare such as lamb chops marinated in exotic spices and salmon tandoori. Cocktails will be made from liquors infused with spices, and there’s beer and wine. The 40-seat covered patio allows access to the restaurant's hookah selection. Bombay Brasserie serves lunch and dinner daily. Bombay Brasserie, 900 Mansell Rd., Ste. 1, Roswell, GA 30076, 770-299-1634. Charlotte-based 5Church is spreading its wings, to both Charleston and to Atlanta. The latter operation, which opened June 24, 2016 in Colony Square, has RJ Cooper as its executive chef. Cooper, who helmed several important restaurants in Washington, D.C., is a Detroit native, but he's not unfamiliar with Atlanta, having worked with Günter Seeger at The Ritz-Carlton, Buckhead, and Gilbert Le Coze at Brasserie Le Coze in Phipps Plaza. Teaming with corporate executive chef Jamie Lynch, Cooper will develop what the company calls a "technique-driven menu" for 5Church Atlanta. 5Church Atlanta, Colony Square, 1197 Peachtree St. NE, Atlanta, GA 30361, 404-400-3669. Busy Midtown restaurateurs Billy and Jenn Streck have opened Hampton & Hudson in Inman Quarter. Jason Hall, formerly of now-closed Max's Wine Dive and Mason Tavern on Clairmont Road in Decatur, heads the kitchen. Casual, sharable plates will include a pork terrine "Wellington," chicken liver mousse, chicken biscuit sliders and a chef's selection of house-made pickled vegetables; duck cassoulet is among the heftier choices. Many options are vegan/vegetarian and gluten-free. Some 20 craft beers will be offered. Hampton & Hudson, Inman Quarter, 299 N. Highland Ave. NE, Atlanta, GA 30307, 404-948-2123. Jay Swift (4th & Swift) has launched Noble Fin in Peachtree Corners, with his son, Jeb Aldrich, at the helm. Occupying a former Dreamland BBQ location, the restaurant seats 200-plus in a 5,200-square-foot space. Noble Fin is the design work of Jay George Design & Architecture, while Kristin Kong Design is responsible for the décor. Seafood is the menu's focus, appropriate in a coastal atmosphere suggested by weathered hardwood flooring. 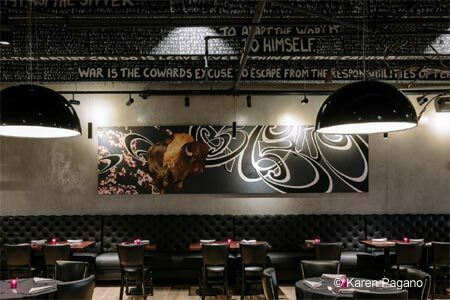 There is a raw bar serving small plates and a steakhouse menu is available, plus chicken, pork, lamb and duck. Seating is a mix of banquettes and tables, and an open kitchen fronted by a hollowed-out canoe provides additional visual interest. Noble Fin, 5260 Peachtree Pkwy., Peachtree Corners, GA 30092, 770-599-7979. Alex Brounstein has opened his newest Grindhouse Killer Burgers, a long-anticipated Decatur location. The handsome, modern building has a rooftop sports bar, and we can only imagine how popular this will be in the fall and football season. The chain started with a small vendor spot in the Sweet Auburn Curb Market, where it's still dishing up fine burgers, and now has a freestanding spot on Piedmont Road, plus two locations at the airport and one in Athens. A location on Memorial Drive is slated for next year in the Atlanta Dairies development, soon to launch. This new outpost at 433 N. McDonough St. serves lunch and dinner daily. Grindhouse Killer Burgers, 433 N. McDonough St., Decatur, GA 30030, no phone. Charlotte, North Carolina-based The Cowfish Sushi Burger Bar has opened an Atlanta location at Perimeter Mall. The menu is a fusion of such items as burgers and sushi rolls --- imagine a cheeseburger roll. Everything from fried pickles to yellowtail is on the wacky menu. The Cowfish Sushi Burger Bar, Perimeter Mall, 4400 Ashford Dunwoody Rd. NE, Dunwoody, GA 30346, 770-225-0009. Anne Quatrano and Clifford Harrison announced that they'll move Bacchanalia and Star Provisions in 2017 to a building they will own independently. Star Provisions To Go will remain in its current location in the Westside Provisions District, and Little Bacch will end its short existence. Chef Joe Schafer will remain as executive chef for Bacchanalia. The new building will be erected at the Ellsworth Office Lofts site on Ellsworth Industrial Boulevard, about a mile and a half from the current location, and should be ready early in the year. Local firm Perkins + Will is the project's designer. With the addition of many new businesses at the Westside Provisions District, parking had become significantly constricted. Bacchanalia and Star Provisions have been at the Westside Provisions District since 1999. Bacchanalia, Westside Provisions District, 1198 Howell Mill Rd. NW, Atlanta, GA 30318, 404-365-0410. Aria has re-opened after an extensive renovation. 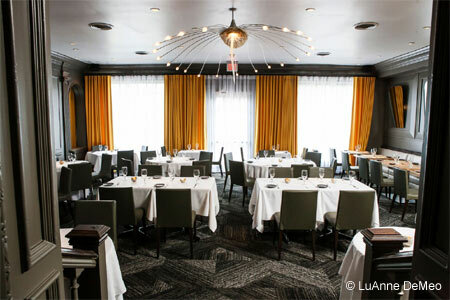 Stacey Kirby of Atlanta’s Seiber Design gave the popular Buckhead restaurant warm gray walls, bright canary yellow drapes and glowing backlit custom mirrors, along with new leather banquettes. An oversize antique mirror appoints the upstairs dining room and white oak tabletops serve the banquettes in the main dining room. Aria’s bar area is opened up with seating for casual diners (no reservations required), and features a new white marble bar top along a rich walnut bar. The plan is to reduce the formality of the previously stark white space, although the exterior still sparkles with its signature white tones. Aria, 490 E. Paces Ferry Rd. NE, Atlanta, GA 30305, 404-233-7673. Justin Anthony closed his Yebo restaurant in Phipps Plaza and opened Yebo Beach Haus in the former Coast address that was part of Tom Catherall's Here to Serve restaurant group. There are some South African touches on the menu, such as boerewors meatballs and shrimp peri-peri tacos, but the concept overall involves more small plates than were available at the previous iteration. Anthony's wife Kelly, an interior designer, has revamped the space, giving it a beachy feeling. Yebo Beach Haus, 111 W. Paces Ferry Rd. NW, Atlanta, GA 30305, 404-869-1992. After more than four decades in its location on Cheshire Bridge Road, Alfredo's has closed as the property has been sold and will be redeveloped as an apartment complex. Owner Perry Alvarez says he is trying to find another location. Alfredo's, 1989 Cheshire Bridge Rd. NE, Atlanta, GA 30324, no phone. Celebrity chef Marvin Woods has closed his barely year-old Asante in downtown Atlanta and plans to move it to an undisclosed address. According to a message on his restaurant's website, he will take the summer to build out the new location. Asante, 250 Park Ave. West NW, Atlanta, GA 30313, no phone.